Clearwater Historic Lodge guests have easy access to some of the best fishing in the BWCA available. 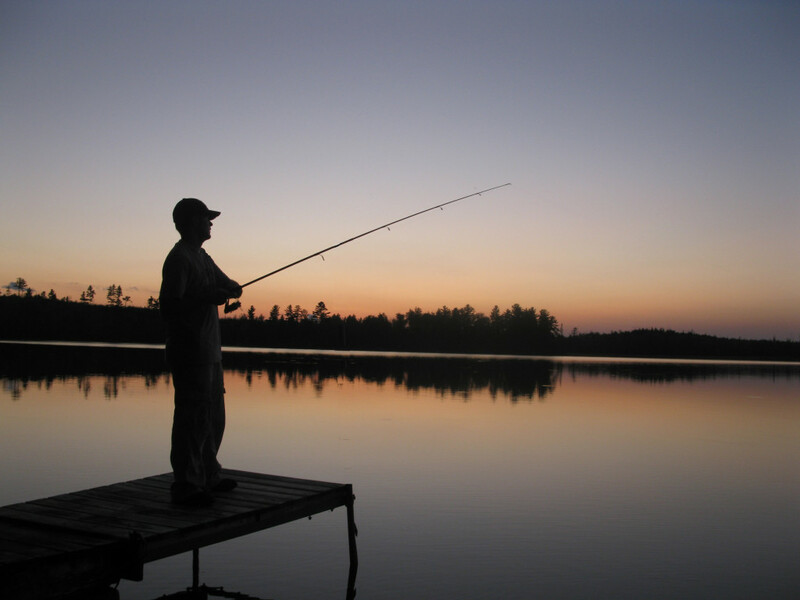 See below for a guide to our nearby lakes and what type of fishing each offers, the tackle and gear we can provide, as well as what you need to know about getting a fishing license. Clearwater Lake: This crystal clear lake holds Lake Trout and Smallmouth Bass and the weeks immediately after the ice goes out is the best time to try your luck. Typically Mid-May to Mid-June is the best time to try trolling spoons and deep diving crank baits for Trout. As the lake warms the Lake Trout head for deeper cooler waters and finding them can be challenging with out sonar and a down rigger. By Mid-June the Smallmouth Bass in the lake will be very active and can be easily found throughout the day along shorelines with soft plastics, and in the evening with top water lures. Caribou Lake: A 210 rod portage from Clearwater Lake brings you to this excellent lake. 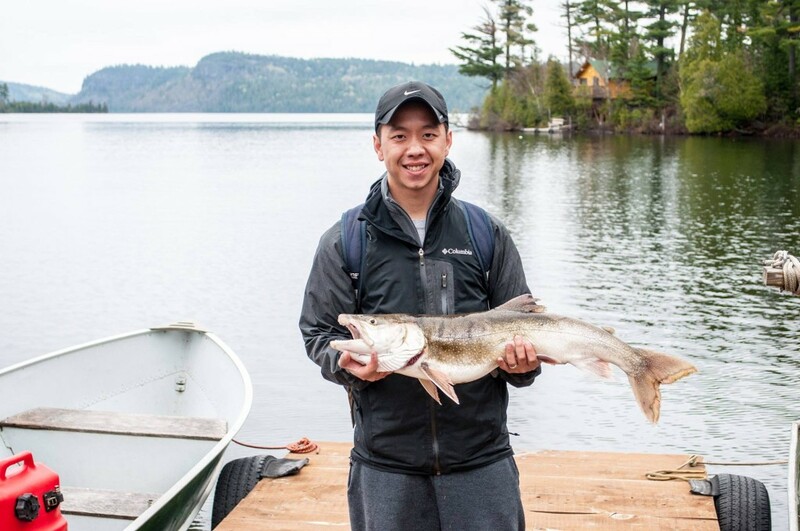 Offering Walleye, Northern Pike, and Smallmouth Bass Caribou Lake should not be missed. As soon as the ice goes out head for the shallow warm waters at the far east end for Walleyes and Northerns; simple slow presentations work best this time of year, and if you can pack in minnows you will catch fish. As the waters heat up into June the Walleye and Pike head for deeper water and can be found on structure throughout the lake. The Smallmouth Bass fishing on Caribou is some of the best fishing in the BWCA; with consistent 20″+ fish being caught every summer. Mountain Lake: This is the lake to head to if you want to catch dinner. For a few weeks after the ice goes out eater size Lake Trout will pretty much jump in the boat. An 80 rod portage will deposit you and your canoe in waters that can be fished from shore. Jumping in the canoe and trolling close to shore with small spoons or shallow diving crank baits will definitely have you limiting out. Like all Lake Trout lakes as the waters warm they head into the depths and can be a challenge to find, especially from a canoe. Mountain Lake also has numbers of mid sized Smallmouth that can be easily found throughout the summer along most of the lakes shoreline. Deer and Moon Lakes: These two small lakes south of Clearwater are great options for early season Walleyes and Northerns. The same 210 rod portage that leads to Caribou Lake can be used to access Deer Lake. Slowly drifting the narrows towards the portage to Moon with “Lindy” rigs and leeches will most likely prove successful. There are a number of shallow reefs on Moon Lake which can be great places to try later in the season once the water warms up. For lake maps or information on other area lakes head to the Minnesota DNR Lake Finder Page. Our shop at Clearwater Historic Lodge stocks the lures we personally use and recommend for having the best chance at netting the big one. We also have leeches and night crawlers for sale.